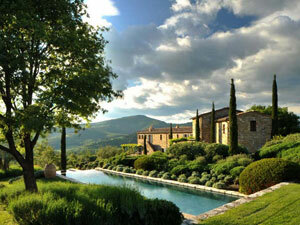 Col delle Noci is one of ten 5-star luxury villas available to rent on a private estate of Castello di Reschio. This private estate covers 2,000 acres of Umbrian countryside with expansive views of rolling hills, olive groves and vineyards and forests of ancient oak and chestnut trees. Little has changed since St. Francis of Assisi preached here in the Middle Ages. Noci or Col delle Noci to give its full name - Walnut Hill - consists of two buildings: the Main House and Guest Annex. The buildings lie high up on a gentle slope overlooking the entire Reschio estate and nature reserve. Noci is a converted 17th century farmhouse restored to the highest standard of renovation and design. A mature olive grove and impressive views, a split level 4 x 18m overflow pool facing the Castle of Reschio and several outdoor sitting areas are what makes Noci a truly fascinating property. The entrance hall leads to a open plan dining/living are that is open to a large well equipped kitchen with separate pantry. This room leads into a study and guest bathroom. Up the stairs is a double bedroom with en suite bathroom and walk in wardrobe and the master suite. The master suite contains a double bedroom with en suite bathroom, separate shower, dressing room, study, private loggia, and direct access to the garden via outside staircase. Through the main entrance is a living room with a kitchenette. A separate entrance also contains a laundry room. Up the stairs is a double bedroom and bathroom with separate shower.